I have been involved in resistance to BC Hydro's proposed Site C dam on the Peace River in northeast British Columbia in Treaty 8 Territory since 2015. 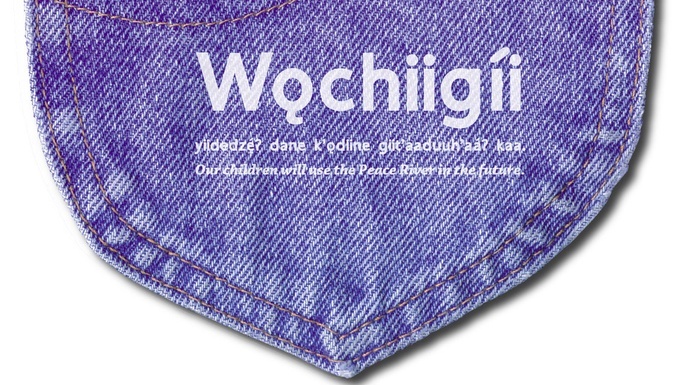 To support the farmers and First Nations people who have been trying to stop the dam, I designed and printed shirts in Cree and in Dane-zaa as fundraisers for RAVEN Trust, then continued with other fundraising efforts and art projects. 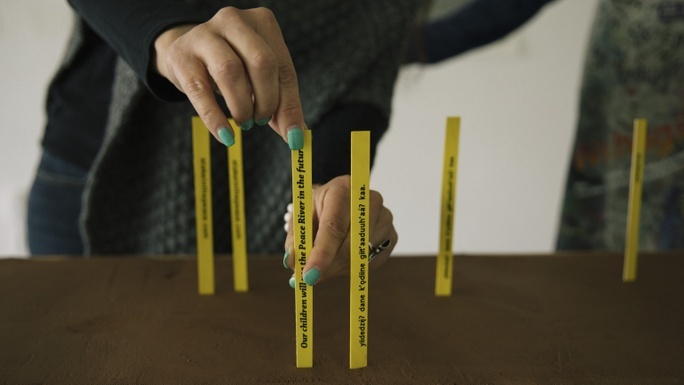 In the summer of 2016, BC Hydro's drilling on the farm of Ken and Arlene Boon - prime agricultural land slated for flooding - annoyed my partner so much that we pounded a mock survey stake outside our gallery and home in Wells, BC. Wendy Holm and others turned that yellow stake symbol into an effective fundraising campaign called Stake In the Peace. I made a small version of the field of stakes for an exhibition in Prince George in April, 2017 at Omineca Arts Centre. 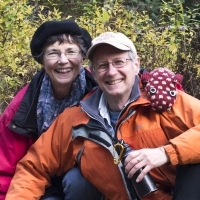 BC's government decided in December, 2017 to continue the Site C dam, in spite of the evidence against it, but resistance continues in many forms. The people of the Peace River valley have taught me many things and given me many gifts - more than I have contributed to their cause. I want to share my printing skills so that others can produce their own projects and designs. Some may wish to print personal images; others may produce items to help "Keep the Peace". Many people do not have access to visual art tools or have received negative messages in school. I believe everyone has creative abilities. With practice and support, anyone can find new ways to express their ideas and visions. Screen printing makes it possible to create products like shirts, posters or stickers for campaigns or fundraising, as well as making artistic prints. Water based inks are safer than traditional solvent-based inks, and low-tech methods allow production with a minimum of equipment. And it’s fun to print your own design! "Learn by doing" - my screen printing workshops are participatory and experiential. Limiting the workshop size to eight people makes it possible to tailor the program to everyone's particular printing goals. Presenting a weekend workshop in the Peace River region involves travel, material costs, space rental, and a basic honorarium. I have drafted a budget of $2400 (Canadian dollars) for this project and am asking for your help in fundraising to meet that target. 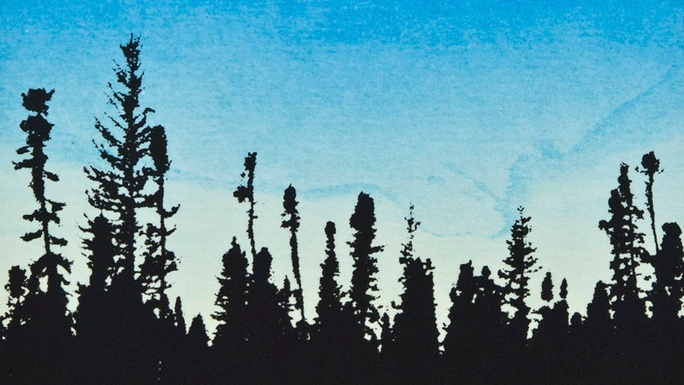 Editioned glow-in-the-dark silkscreened prints: "Black Spruce Aurora I" 13.5 × 21.5 cm (detail shown here; full image at https://bill-horne.net/landscape-prints/). "stakeinthepeace" or "Peace River Solidarity" shirts on 100% cotton. To share low-tech screen printing techniques with #keepthepeace activists in a two day workshop in Treaty 8 Territory in northeast British Columbia May 12-13, 2018. $85 "Black Spruce Aurora I"
A hand silkscreened stakeinthepeace shirt on 100% cotton. Est. Delivery Date: Within 30 days of the end of the campaign. 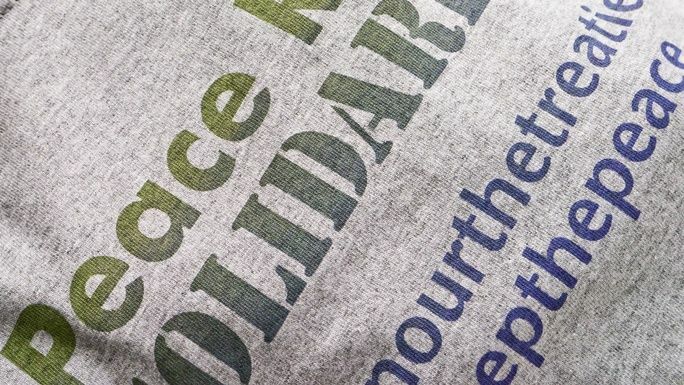 $20 Peace River Solidarity on a shirt! A hand silkscreened Peace River Solidarity shirt on 100% cotton made with water based inks. A small, wooden version of a stakeinthepeace hand silkscreened with one of a dozen assorted hashtags, selected at random.